Snow days are hard on agencies. Imagine chaining hundreds of buses and fundamentally altering your network on short notice. Doing so protects rider safety and is very necessary in a hilly town, but it causes a lot of pain too: it breaks transfers, hoses real-time information, leaves large network gaps (cough, First Hill or Wedgwood), and creates an environment of general chaos. Our periodic complaints are still valid, but agencies deserve praise for the sheer amount of hard work that goes into keeping the network functioning at some level. But no matter how many tweets are sent or how many pleas are issued to sign up for text alerts, thousands of riders are going to do one thing: walk to their stop like they normally do, unaware anything has changed, and stand there for up to an hour or more. Absent real-time info and/or alerts at every stop, this sort of information vacuum will always be with us. But standing for an hour in the cold seething that your bus hasn’t arrived clearly isn’t acceptable either. So what to do? In a word: stickers. As we’ve written recently, the basic dynamics of snow routes are relatively fixed. After all, the Counterbalance isn’t getting flatter, and the artic-killing hills aren’t going anywhere. So the structure of snow routes endure, and a stop that isn’t served today is unlikely to be served a decade from now. Our neighbor to the north, Community Transit, simply places a crossed-out snowflake icon on its bus stops, letting riders know that the stop is not served in a heavy snow event. Our route signs have ample real-estate for such a decal, and we already do this for the NO LIFT stops that cannot serve wheelchairs. A simple sticker can communicate to everyone at a particular stop without any ongoing agency labor, and it doesn’t require that everyone check their phone or happen to be in the know. Metro should place these on their signs. It won’t fix everything, but it couldn’t hurt. That won’t work b/c it’s subject to change. The elegance of a snow sticker is it doesn’t need to be dynamic. The sticker reminds people to check their phone to figure out where their best alternate is. Taking a look at the picture, until I scrolled down to read what the icon meant, I had no idea. After I scrolled down, it was obvious, but that was hindsight, too late. I think you really need a sentence of text next to the icon spelling out “This stop will not be served during heavy snow”. Good point. How about “No Snow Service,” to go with the “No Lift” decal? I like the icon itself so much – visible from a bit of a distance, no English necessary, and a low tech but elegant solution that I’d only put William C’s small short sentence at the bottom. You only need the sentence once, maybe even less than once as one would hope that a pedestrian walking by would say something as you waited. More important to make the icon universal throughout the region. Metro, ST, Pierce, etc should declare the CT sticker a best practice and buy them from CT.
Great point about having a common symbol for the region. CT seems to have already settled on a design, so the other agencies should copy it simply for consistency. Don’t overcomplicate. It’s easy to understand without words. Clean and simple, too. Great idea, Zach. And yes, keep the symbol universal throughout the region. Luckily, Community Transit explains what the symbols means on bus stop schedules and in their schedule book. You could always do the WTA (Bellingham) approach and just f-ing deal with it. WTA doesn’t do snow routes, so the bus might be late, but it will still get there. Despite running on the regular routes, generally the buses in town run on time even on the worst snow days. This is not so true of the rural routes, where the buses are essentially functioning as plows. You still have the Queen Anne and First Hill problem. Buses get stuck on the hill and can’t move for the rest of the day and block traffic, or they slip on the ice and crash into cars and people and gardens. Seattle has steep enough hills and freeszing-thawing-icing layers it needs reroutes and shuttles. Bellingham may not have that as much, or since it’s a smaller community it may be more acceptable to just cancel service if the buses can’t make their regular route. Donde, it’s been a few years since I’ve been in Bellingham, so I don’t remember. But do their bus routes have the hills we do? I really think it’s a health and safety hazard to allow, let alone encourage, anyone to stand at a bus stop with any hope at all a bus will come by. Reflectorized snowflakes on signs? Great idea. But would limit bus service itself to arterials without any grades that would slow a bus down to the point it can’t maintain headway. Urban arterial transit should run headways instead of schedules anyway. Where buses can’t handle ten minute headway, or whatever emergency medics’ judgment about maximum exposure limit, transit system should just announce service is canceled. Apps, TV, radio- you name it. Also, system should encourage an understanding that can make safety self-regulating. If a passenger can walk to closest operating arterial, best they should. If not, they shouldn’t be outdoors trying to catch a bus anywhere. I also wonder if, with the money saved by never having buses get stuck or slowed beyond any regular operations, transit could operate or contract out snow-qualified smaller vehicles, more or less on call for people with emergencies or urgencies? Though suspect it’ll have to be publicly run, because I don’t see a profit in it. Just necessity. I think it’s fair to say that in parts of town, Bellingham’s hills are worse. And this is in the parts of town that matter – the busiest transit corridor in the city, WWU, is a series of steep hills and hairpin curves. On snowy days, they usually run on schedule at the 15-minute headways as designed. Bellingham does have hills, but WTA doesn’t have articulated buses. Then run non-articulated ones from your reserve fleet. An overcrowded bus is better than none at all. It’s hard to find current numbers, but in 2012 42% of the fleet was articulated. I’d bet that the percentage is higher now. There aren’t enough non-articulated buses “in reserve” to make up that kind of difference. I assume that Metro already swaps in as many of them as possible, presumably on the hillier routes. The sticker should perhaps distinguish between stops that lose all service and stops that are on a shuttle. I live along the Madrona Park tail of the 2, which gets cut off in snow. Theoretically, service there is provided by the 27 Snow Shuttle that also serves Leschi and Colman Park. But I didn’t actually see a single 27 Snow Shuttle (or tracks from one) during the entire time Metro was on snow routes. Part of the communication is not just whether any bus will come, but whether it will go way out of the way from where it usually does. If you live within a mile of the regular (non-shuttle) part of the route it may be better to walk to it than to wait for the shuttle and then wait again for the second bus. Or are you saying that shuttle stops should have the same sticker as no-service stops? I’ve never ridden the shuttles so i don’t know how reliable they are. I thought they were more reliable than the non-shuttle part of the route because they’re in low-traffic areas and have non-articulated diesel buses with chains. On our snowy Monday, I was looking up info on Metro’s Route 131. The published timetable map clearly shows a snow reroute, but the on-line alert said the Route 131 does not have any defined snow reroute. Leaving me rather confused as to where the bus might actually be operating that day. Did you make sure to click on the right region? 102 in central seattle says the same. Click on southeast king county you learn about the Fairwood shuttle. 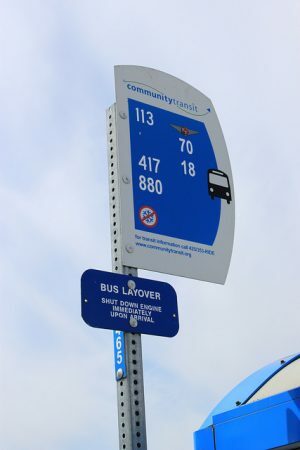 I was standing at a pierce transit stop on monday with the same idea- “How do I know if the bus is going to serve this stop? If inly,there were some sort of icon to designate this stop as a snow route” Most buses that go downtown here all detour through Stadium to make their way safely to Commerce, and some areas like University Place simply don’t get served.